Known as “The Gem of the Desert,” La Quinta is a resort city nestled on the floor of the Coachella Valley, between the cities of Indian Wells and Indio. The city is considered one of the country’s top golfing destinations, with its selection of over 20 world-class golf courses including the legendary PGA West, which hosts the prestigious Desert Classic tournament presented by Workday, formerly known as the CareerBuilder Challenge, Palm Springs Golf Classic, the Bob Hope Desert Classic, the Bob Hope Chrysler Classic, and the Humana Challenge. The very first residents of the La Quinta area were the Desert Cahuilla Native Americans, one of the few Native American tribes who utilized wells. In the 1800s, the area was a very prominent farming community as its climate was ideal for producing vegetables, sweet corn, exotic dates, seedless grapes, and Bermuda onions. As the area became easier to access, many residents of nearby Los Angeles frequently made trips to the area. 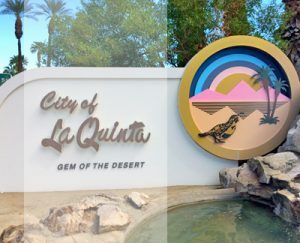 The city of La Quinta was officially incorporated on May 1, 1982, and was named after the La Quinta Resort, which was originally established in 1926. La Quinta boasts a selection of first-class real estate options that are sure to please even the most discerning buyers. Homes in the area are available in a variety of sizes, styles, and floor plans – buyers can choose from luxury condos, well-appointed townhomes, gorgeous single-family homes in prestigious golf communities, and more. Homes in La Quinta blend seamlessly with the resort city’s picturesque surroundings, boasting elegant architectural styles such as Pueblo Revival, Mediterranean, Ranch, contemporary, and more. For buyers in search of their dream luxury home, there’s a wide array of properties offering an unparalleled lifestyle. Many homes are equipped with impressive features such as expansive courtyards with fountains, light-filled living spaces, chef’s kitchens with new stainless steel appliances, elegant bathrooms with exquisite custom tile work, sprawling outdoor decks with BBQ areas, beautiful master suites, and many more. The iconic La Quinta Resort & Club is home to five championship golf courses along with a range of high-end amenities such as indoor/outdoor yoga venues, a state-of-the-art spa, award-winning fine dining restaurants, a first-class tennis facility, and so much more. For more information on La Quinta Resort & Club, visit their website here. Golf enthusiasts in La Quinta are always minutes away from the legendary PGA West, home to six renowned golf courses. Encompassing roughly 2,000 acres, the prestigious golf and lifestyle community is surrounded by panoramic views of the Santa Rosa Mountains, and is one of the best destinations not only for golfers, but for anyone looking forward to enjoying some of the best amenities La Quinta has to offer. Old Town La Quinta is one of the city’s most popular attractions, with its high-end fashion boutiques, exciting nightlife venues, must-try restaurants, and wine tastings. The scenic lifestyle venue also hosts incredible seasonal events, including Taste of La Quinta, Art Under the Umbrellas, and the Sunday Certified Farmers’ Market.